The aims of this study were to characterize the metabolite profiles of triple negative breast cancer (TNBC) and to investigate the metabolite profiles associated with human epidermal growth factor receptor-2/neu (HER-2) overexpression using ex vivo high resolution magic angle spinning magnetic resonance spectroscopy (HR MAS MRS). Metabolic alterations caused by the different estrogen receptor (ER), progesterone receptor (PgR) and HER-2 receptor statuses were also examined. To investigate the metabolic differences between two distinct receptor groups, TNBC tumors were compared to tumors with ERpos/PgRpos/HER-2pos status which for the sake of simplicity is called triple positive breast cancer (TPBC). The study included 75 breast cancer patients without known distant metastases. HR MAS MRS was performed for identification and quantification of the metabolite content in the tumors. 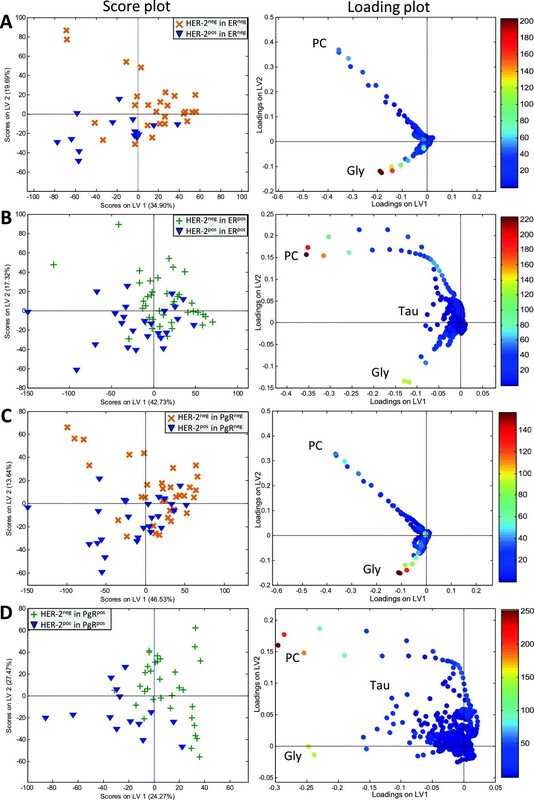 Multivariate partial least squares discriminant analysis (PLS-DA) modeling and relative metabolite quantification were used to analyze the MR data. Choline levels were found to be higher in TNBC compared to TPBC tumors, possibly related to cell proliferation and oncogenic signaling. In addition, TNBC tumors contain a lower level of Glutamine and a higher level of Glutamate compared to TPBC tumors, which indicate an increase in glutaminolysis metabolism. The development of glutamine dependent cell growth or “Glutamine addiction” has been suggested as a new therapeutic target in cancer. Our results show that the metabolite profiles associated with HER-2 overexpression may affect the metabolic characterization of TNBC. High Glycine levels were found in HER-2pos tumors, which support Glycine as potential marker for tumor aggressiveness. 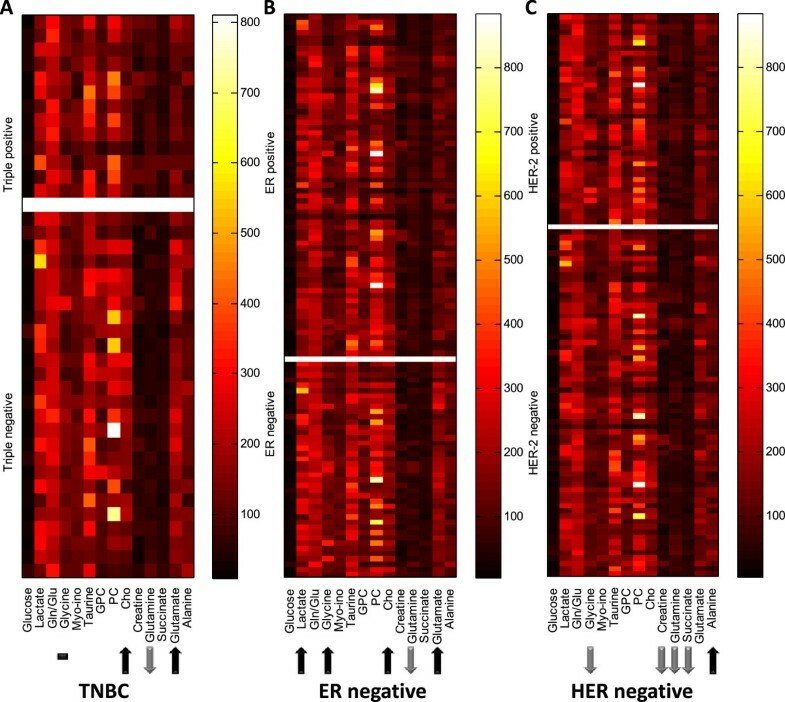 Metabolic alterations caused by the individual and combined receptors involved in breast cancer progression can provide a better understanding of the biochemical changes underlying the different breast cancer subtypes. Studies are needed to validate the potential of metabolic markers as targets for personalized treatment of breast cancer subtypes. Triple negative breast cancer (TNBC) is a heterogeneous subgroup of breast cancer characterized by the absence of expression of estrogen receptor (ER), progesterone receptor (PgR) and human epidermal growth factor receptor-2/neu (HER-2). TNBC represents approximately 15-20% of all breast cancer cases and is generally considered as the most severe subgroup of breast cancer. Patients diagnosed with TNBC are largely unresponsive to currently available targeted therapies, such as Tamoxifen and Trastuzumab, in addition to having a higher risk of relapse and a higher mortality rate compared to other breast cancer subtypes . Treatment with protein inhibitors against PI3KCA and HSP90 have shown to be efficient in only a subset of TNBC . Therefore, there is an urgent need to identify new molecular targets for treatment of TNBC to improve treatment care and survival of this breast cancer subgroup. Classification of breast cancer according to molecular subtypes is highly relevant and may provide significant prognostic information related to patient outcome. Several studies have investigated the underlying genomic and transcriptomic characteristics of TNBC [3–5]. The results suggest the existence of a variety of TNBC subtypes including basal and non-basal, p53 mutated and high genomic instability, among others . For example, five distinct subtypes of TNBC have been suggested based on gene expression profiles . In a recent study, TNBC was subdivided into basal or 5-negative phenotype dependent on the expressions of assorted basal markers, including cytokeratin 5 (CK5) and epithelial growth factor receptor (EGFR) using immunohistochemistry (IHC) and in situ hybridization . The validation of reliable markers for breast cancer sub-classification is still ongoing. Altered energy metabolism is a new emerging hallmark of cancer . Increasing evidence suggests that alterations in cancer metabolism, especially choline phospholipid and amino acid metabolism may provide potential targets for treatment of breast cancer. To our knowledge, the metabolite profiles of TNBC and the metabolic influences of HER-2 overexpression have not yet been investigated in detail. Metabolomics, defined as a systematic study of the metabolism, has proven to be an important tool for the identification of new biomarkers for targeted treatment, treatment evaluation and prediction of cancer survival [8–11]. Previous studies have shown the potential and benefit of combining the different OMICS approaches, e.g. transcriptomics and metabolomics, for better molecular characterization and stratification of breast cancer [12–15]. Ex vivo high resolution magic angle spinning magnetic resonance spectroscopy (HR MAS MRS) can be used for the identification and quantification of the metabolite content in a biological tissue sample. HR MAS MRS is a non-destructive technique meaning that the tissue remains intact after examination and can be used for other OMICS approaches, thus allowing for a comprehensive and detailed study of the molecular composition of the tissue. By using HR MAS MRS, more than 30 metabolites can be detected and assigned simultaneously in breast cancer tissue . HR MAS MRS has been widely used to study cancer related pathways, including choline phospholipid metabolism, glycolysis (the Warburg effect), amino acids, lipids and polyamines, among others [17–19]. The metabolite profiles acquired by HR MAS MRS have shown to correlate to hormone receptor status, treatment response and survival in breast cancer [20–24]. Analysis of HR MAS MRS spectra can be challenging due to the high number of collinear variables (exceeding tens of thousands of data points per sample). Multivariate data analysis is a suitable method for analyzing the complex and high dimensional MRS data. Partial least squares discriminant analysis (PLS-DA) can be used to identify metabolic differences between distinct classes by finding linear relationships between the spectral data and class variables, e.g. receptor status . In addition to multivariate modeling, quantification of the individual metabolites can be achieved by calculating the area under the peak signal. Most studies have compared TNBC with non-triple negative breast cancer, most commonly ERpos/PgRpos breast cancer subtype, in those studies the effects of HER-2 overexpression were not considered. In this study, we have investigated the metabolic differences between TNBC tumors and tumors with ERpos/PgRpos/HER-2pos status, which for the sake of simplicity is called triple positive breast cancer (TPBC). We have also examined the influences of ER, PgR and HER-2 receptors status individually on breast cancer metabolism and explored the metabolite profiles associated with HER-2 overexpression. Metabolic alterations caused by the individual and combined hormone and growth receptors may help identify potential targets for treatment of breast cancer subtypes. Included in this study were patients (n = 75) aged 34 to 90 diagnosed with breast cancer without known distant metastasis. The patients did not receive any pre-surgical therapy for their cancer disease. The biopsies were extracted immediately after surgical removal of the tumor. Parts of the tumor were used for routine analyses, including tumor grade, ER, PgR and HER-2 status (Table 1). Tumors were considered positive for ER and PgR when more than 10% of tumor cells showed positive staining by IHC. The samples were tested for HER-2 gene expression using a validated dual probe fluorescence in situ hybridization (FISH) assay (HER-2 IQFISH pharmDx/HER-2FISHpharm Dx) or for protein overexpression using a validated IHC assay (HercepTest, DAKO). The HER-2 gene was considered amplified if the gene to chromosome 17 ratio was larger than 2.0 analyzed by FISH or evidence of protein overexpression by IHC score 3+. Another part of the tumor was snap frozen immediately during surgery and stored in liquid nitrogen for MRS analysis. All patients have signed a written informed consent, and the study was approved by the Regional Ethics Committee, Central Norway. NA: not available, ER: estrogen receptor, PgR: progesterone receptor, HER-2/neu: human epidermal growth factor receptor-2, TNBC: triple negative breast cancer, TPBC: triple positive breast cancer. Cytological imprint was performed to confirm the presence of tumor cells in the sample before HR MAS MRS and was used as an inclusion criterion and not as a quantitative measurement . This technique is fast and requires minimal preparation. In brief, the tissue was gently pressed on a glass slide and air-dried for approximately 10 minutes. The imprints were fixed in ethanol and stained with May-Grünwald-Giemsa stain (Color-Rapid, Med-Kjemi, Norway). All imprints were reviewed by a well-trained pathologist. Samples with absence of tumor cells were excluded from further analysis. To minimize the effect of tissue degradation on the metabolite profiles, the samples were prepared on ice block and within a short period (5 ± 1 min). The biopsies (13 ± 3 mg) were cut to fit 30 μl disposable inserts filled with 3 μl phosphate buffered saline (PBS) in D2O containing 1.0 mM TSP for chemical shift referencing and 1.0 mM Format for shimming. The HR MAS spectra were acquired on a Bruker Avance DRX600 spectrometer equipped with a 1H/13C MAS probe with gradient (Bruker Biospin GmbH, Germany) using the following parameters; 5 kHz spin rate, 4°C probe temperature, cpmgpr1D sequence (Bruker Biospin GmbH, Germany) with 273.5 ms total echo time, a spectral width of 20 ppm (−5 to 15 ppm) and 256 scans (NS). For some patients, more than one biopsy (taken from different places in the tumor) were prepared and analyzed by HR MAS MRS. Following acquisition, the spectra were Fourier transformed into 65.5 k after 0.3 Hz line broadening and TSP was calibrated to 0.00 ppm (Topspin 3.1, Bruker Biospin GmbH, Germany). The following spectral preprocessing steps were carried out using Matlab R2009a (The Mathworks, Inc., USA). Spectral regions containing signals from chemical contaminations (e.g. ethanol), water, and lipids were removed before multivariate data analysis. Baseline offset was corrected by setting the lowest point of each spectrum to zero. The spectra were normalized to equal total area to account for differences in sample size. Furthermore, the spectra were peak aligned using icoshift . The spectral region between 1.5 – 4.7 ppm, containing the majority of low-molecular weight metabolites, was used as the final input for the multivariate models. PLS-DA and metabolite relative quantification were performed to evaluate the metabolic differences between the tested groups using Matlab and PLS_Toolbox 6.2.1 (Eigenvector Research, USA). The spectra were mean-centered before the PLS-DA modeling. The classification results were calculated using random cross validation (20% for testing and 80% for training, repeated 20 times). In cases where there were multiple spectra from the same patient, all of these spectra were either used for training or testing. The number of latent variables (LVs) used for all repetitions was chosen by leave one patient out cross-validation of the whole data set. Permutation testing, carried out by randomly assigning the class labels, was performed to evaluate the statistical significance of the classification results . The permuted classification result was calculated as described for the PLS-DA models and repeated 1000 times. Metabolites importance in the PLS-DA loading were identified by variable importance in the projection (VIP) scores . Relative metabolite quantification was performed by peak integration using mean normalized spectra after removal of water, lipids and contaminations. Statistical differences between the groups were tested by Wilcoxon testing with Benjamini Hochberg correction for multiple testing. P-values ≤ 0.05 were considered significant. The p-values adjusted for multiple testing are given as q-values. While P-values are used as an indicator of the false positives in all tested values in the dataset, the q-values are used to interpret the false discovery rate (FDR) among significant p-values. To give a more accurate indication of the FDR both p- and q-values are listed in the results. The quantification results are illustrated by heat maps (Matlab R2009a). Spectra from biopsies with absence of tumor cells and low spectral quality with high noise and severe chemical contamination were excluded from further analysis (n = 4). In total, 106 biopsies from 73 patients were included in the data analyses. A representative metabolite spectrum of breast cancer tissue obtained by HR MAS MRS is shown in Figure 1. The metabolite data shows no significant association with tumor grade and lymph node status by PCA and PLS-DA modeling (data not shown). The PLS-DA classification results of TNBC, ER, PgR and HER-2 are summarized in Table 2. Breast cancer metabolite spectrum and cytology image. (A) A representative metabolite profile of breast cancer tissue acquired with HR MAS MRS. (B) Imprint cytology slide of breast cancer tissue stained with May-Grünwald-Giemsa staining. β-Glc: beta Glucose, Lac: Lactate, Gly: Glycine, m-Ino: myo-Inositol, Tau: Taurine, s-Ino: scyllo-Inositol, GPC: Glycerophosphocholine, PC: Phosphocholine, Cho: free Choline, Cr: Creatine, Gln: Glutamine, Glu: Glutamate, Ala: Alanine. b = biopsies/p = patients. PLS-DA: partial least squares discriminant analysis, CV: cross validation. The PLS-DA shows the highest CV accuracy for separating TNBC and TPBC (77.7%, p = 0.001). The corresponding score and loading plots show a clear separation between the two groups. TNBC is characterized with higher levels of Choline and Glycerophosphocholine (GPC), and a lower level of Creatine compared to TPBC (Figure 2A). Based on the loadings, high levels of PC and Glycine were observed in some tumors, but their influence in the classification model are unclear. Relative quantification shows consistently higher levels of Choline (p = 0.008, q = 0.041) in TNBC tumors. Lower levels of Glutamine (p < 0.001, q = 0.001) and higher levels of Glutamate (p = 0.002, q = 0.015) were also observed in TNBC compared to TPBC tumors (Figure 3A). Creatine appears to be important for separating TNBC and TPBC in the multivariate analysis identified by a high value of VIP score. Lower levels of Creatine were also found in TNBC compared to TPBC tumors by relative quantification, however, the q-value was not significant (p-value = 0.031, q-value = 0.109). PLS-DA score and loading plots of (A) TNBC versus TPBC, (B) ER neg versus ER pos , and (C) HER-2 neg versus HER-2 pos breast cancer tumors. In the score plots (left), each symbol represents one sample. The score plots show the first and second latent variables (LV), and are used for interpreting relations between samples, thus similar samples are located close to each other. In the loading plots (right), the symbols represent metabolites that are significantly important for the discrimination between the groups. Variable importance in the projection (VIP) scores are illustrated by the heat map. The majority of TNBC, ERneg and HER-2neg samples have positive score for LV1. The PLS-DA model of TNBC versus TPBC shows best classification results, see Table 2. Gly: Glycine, Lac: Lactate, Cho: Choline, PC: Phosphocholine, Cr: Creatine, Tau: Taurine. Relative metabolite quantification of 14 metabolites and ratio illustrated by heat map. 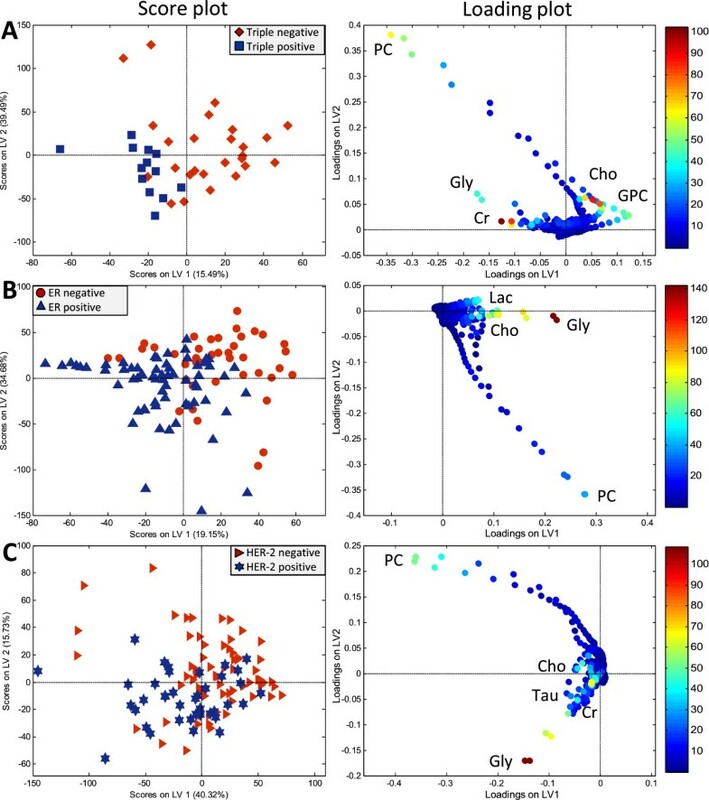 The heat maps illustrate the metabolite intensities calculated by peak integration. The arrows show metabolites with significantly higher (↑) or lower (↓) levels in (A) TNBC, (B) ERneg and (C) HER-2neg tumors compared to TPBC, ERpos and HER-2pos tumors, respectively. Statistical differences between the groups were tested by Wilcoxon testing with Benjamini Hochberg correction for multiple testing. PLS-DA models show clear separations between ERneg and ERpos (72.2%, p < 0.001), and PgRneg and PgRpos (67.8%, p < 0.001) tumors. ERneg tumors show higher levels of Glycine, Choline, and Lactate compared to ERpos tumors, as shown in the score and loading plots (Figure 2B). According to the VIP scores, Glycine appears to be most important for the discrimination between ERneg and ERpos. Higher levels of Glycine (p = 0.002, q = 0.010), Choline (p = 0.021, q = 0.067), Lactate (p < 0.000, q = 0.001), and Glutamate (p <0.001, q <0.001) and lower level of Glutamine (p <0.001, q <0.001) were observed in ERneg compared to ERpos tumors by relative quantification (Figure 3B). PC levels appear to be high in some tumors from both groups, and could not be used to discriminate between ERneg and ERpos tumors. PLS-DA classification and relative quantification of PgRneg and PgRpos tumors show similar metabolite profiles as ERneg and ERpos tumors (data not shown). HER-2neg and HER-2pos tumors were discriminated by PLS-DA with 69.1% CV accuracy (p < 0.001). Contrary to ERneg and PgRneg, HER-2neg tumors have a lower level of Glycine (p = 0.002, q = 0.012) compared to HER-2pos tumors (Figures 2C and 3C). Similar to what was observed for ERneg and PgRneg tumors, lower levels of Glutamine (p = 0.003, q = 0.017) were observed in HER-2neg compared to HER-2pos tumors detected by relative quantification. In addition to the changes in Glycine and Glutamine, HER-2neg tumors also display higher levels of Alanine (p = 0.010, q = 0.039), and lower levels of Succinate (p = 0.001, q = 0.012) and Creatine (p = 0.024, q = 0.075) compared to HER-2pos tumors by relative quantification. In the loading plot, PC levels appear to be higher in some HER-2neg compared to HER-2pos tumors. However, the relative quantification result shows no significant difference in PC levels between the two groups. To investigate the metabolic influences of HER-2 status independently of the hormone receptors status, the metabolite profiles associated with HER-2 status were examined within ERneg, ERpos, PgRneg, and PgRpos tumors separately. The PLS-DA results are shown in Table 3. The scores and loadings of PLS-DA models show higher levels of Glycine in HER-2pos compared to HER-2neg tumors irrespective of ER and PgR status (Figure 4A-D). Glycine levels determined by relative quantification showed a trend of higher levels in HER-2pos compared to HER-2neg tumors in the different ER and PgR status groups (p < 0.021 and q < 0.133). Glutamine also showed a trend of higher level in HER-2pos compared to HER-2neg tumors (p < 0.034 and q < 0.179). In the PLS-DA models, PC appears to be high in some HER-2neg tumors. However, PC level was not significantly different between HER-2pos and HER-2neg by relative quantification. PLS-DA score and loading plots of HER-2 neg versus HER-2 pos status in (A) ER neg , (B) ER pos , (C) PgR neg , and (D) PgR pos tumors. The score plots show the first and second latent variables (LV). In the loading plot, VIP scores are illustrated by heat map. The majority of HER-2neg tumors show positive score for LV1, while most HER-2pos tumors show negative score for LV1. HER-2pos tumors contain higher Glycine level compared to HER-2neg tumors. LV: latent variable, Gly: Glycine. PC: Phosphocholine. Triple negative breast cancer is characterized as being estrogen receptor, progesterone receptor and HER-2/neu receptor negative; it is a heterogeneous breast cancer subtype that is difficult to treat and is associated with high recurrence and poor outcome . Several studies have investigated the underlying genomic and gene expression patterns of TNBC [2–5] while the metabolite profiles of TNBC have not yet been investigated in detail. Most studies have compared TNBC with ERpos/PgRpos breast cancer subtype, which does not take into consideration the influence of HER-2 status on breast cancer molecular profiles. In this study we investigated the metabolite profiles of patients with TNBC compared to TPBC and showed that these two groups could be successfully separated based on the metabolite profiles of tissue biopsies. In accordance with previous studies, altered metabolite profiles were observed in tumors with different expression of ER and PgR . Furthermore, our results show that overexpression of HER-2 might cause alterations to the metabolite profiles of breast cancer independent of hormone receptor status, thus affecting the differentiation between TNBC and TPBC. The basal-like breast cancer subtype is defined through gene expression profiling and is considered to be a more aggressive breast cancer subtype compared to luminal-like and HER-2 enriched gene expression subtypes. The majority of basal-like tumors are TNBC, but not all TNBC are defined as basal-like by gene expression. As previously published, the discrepancy rate is approximately 20–30 % . Furthermore, there exists a significant overlap between TNBC, basal-like and BRCA-1 breast cancer . In our study, TNBC has significantly higher Choline levels compared to TPBC, and this is in accordance with previous findings where higher Choline levels were detected in the more aggressive basal-like xenografts and TNBC patients as compared to the less aggressive luminal-like xenografts and ERpos/PgRpos breast cancer patients . In another study, a significantly higher total Choline (tCho = PC + GPC + Choline) signal to noise ratio (tCho/SNR) was detected in TNBC when compared to non-triple negative tumors using in vivo MRS . Choline-containing metabolites are involved in cell signaling, lipid metabolism, and cell membrane synthesis and degradation. The tCho level detected by in vivo and ex vivo MRS has been suggested as a biomarker for breast cancer diagnosis and response to chemotherapy . Patients with basal-like breast cancer have been shown to be more sensitive to anthracycline-based neoadjuvant chemotherapy than the luminal subtype and a higher percentage of patients with a pathological complete response (pCR) to the treatment was achieved in the basal-like compared to luminal subtypes . However, for patients with residual disease after chemotherapy, the basal-like subtypes showed worse overall survival than the luminal-like. These results indicate that chemotherapy alone is not sufficient to treat TNBC and that more advanced targeted therapy is needed to improve the prognosis of this patient subgroup. Moreover, assessment of clinical response (i.e. changes in tumor size) alone might not be a good predictive measure for treatment, as it cannot give information about the molecular state of the tumor. Interestingly, decreased levels of choline-containing compounds in response to neoadjuvant chemotherapy have been detected in patients with better survival rate [22, 23]. Targeting the genes and enzymes involved in the choline phospholipid metabolism is currently under investigation, and so far the results have been promising. Down-regulation of choline kinase alpha (CHKA), the gene regulating the conversion of Choline to PC, has been shown to decrease cell proliferation, and to increase the effect of chemotherapy in ovarian  and breast cancers , whereas CHKA overexpression increases drug resistance in breast cancer cells . The CHKA inhibitor is currently under phase I clinical trial. Our results suggest that targeting the genes/enzymes responsible for the choline phospholipid metabolism may provide new molecular targets for treatment of TNBC. Alterations in ER, PgR and HER-2 expression have proven to play a major role in breast cancer progression, with ERpos and PgRpos tumors having better prognosis, while HER-2 overexpression is associated with a worse prognosis. Thus metabolic alterations caused by these hormone and growth receptors are highly relevant, especially because the molecular reasons behind their overexpression/amplification remain largely unknown. Similar metabolite profiles were observed in tumors with ERneg and PgRneg, and ERpos and PgRpos status. In accordance with previous findings, we found a higher level of Glycine in patients with ERneg and PgRneg tumors compared to ERpos and PgRpos, respectively . Higher levels of Choline and Lactate were also observed in ERneg and PgRneg tumors, which suggest enhanced glycolytic activity and tumor aggressiveness. ER status is generally accepted as an independent prognostic and predictive factor, while the significance of PgR status is less clear . Although TNBC is considered to be a more aggressive breast cancer subgroup due to low response to available treatment, the overexpression of HER-2 itself is associated with poorer prognosis compared to HER-2 negativity . Patients identified with HER-2pos tumors are often treated with Trastuzumab. Noticeably, it has been reported that about 20-30% of HER-2pos patients fail to respond to first time treatment with Trastuzumab and about 15% of patients will develop resistance to this drug [38, 39]. Therefore, there is also a need to identify new molecular targets for treatment of this breast cancer subtype. In our study, we found high levels of Glycine and Alanine to be associated with HER-2pos breast tumors. Alanine is involved in the synthesis of Glycine from Pyruvate and Serine. High levels of Glycine have previously been shown to correlate with poor prognosis in breast cancer [23, 40, 41]. Glycine is an amino acid involved in the synthesis of proteins, nucleotides and glutathione. The potential role of Glycine as a tumor biomarker has also been studied in human brain tumors, where it was found to positively correlate with tumor grade [42, 43]. Moreover, the synthesis of Glycine from Glucose has been shown to correlate with rapid cancer cell proliferation . Interestingly, we found higher levels of Glycine to be associated with HER-2 overexpression in the ERneg, ERpos, PgRneg, and PgRpos tumors separately, which suggest Glycine to be a specific marker for HER-2 amplification regardless of the ER and PgR status. ERneg and PgRneg tumors and ERpos and PgRpos tumors show comparable results. Tumors overexpressing HER-2 have shown to acquire resistance to estrogen therapy which suggests that there exists a crosstalk between ER and HER-2 status . The p-values for differences in Glycine relative concentration between HER-2pos and HER-2neg were significant before multiple corrections, while the adjusted p-values showed trends towards significance. However, the chance of false positive result as described by the false discovery rate was low. In our cohort, we could not detect any differences in Glycine between TNBC and TPBC, possibly due to the high level of Glycine in ERneg and PgRneg and low level of Glycine in HER-2neg tumors, which may cancel out the differences in Glycine between TNBC and TPBC. Based on our results we suggest Glycine to be associated with tumor aggressiveness in HER-2pos breast cancer. Recently, there has been an increasing interest in detecting the circulating HER-2 protein in serum samples for use as a complementary assay to IHC and FISH analysis for diagnosis, but also for use as a prognostic marker for breast cancer recurrence [46, 47]. High throughput screening of serum metabolites, including Glycine, is feasible using MRS or other laboratory assays and should be investigated further as a breast cancer prognostic marker. Furthermore, significant changes in other amino acids were also observed between the different breast cancer subtypes. Tumors negative for ER and PgR, and TNBC tumors contain lower levels of Glutamine and higher levels of Glutamate compared to tumors with positive receptor statuses which might result from increased glutaminolysis metabolism. Glutamine plays an important role in nucleotide and protein synthesis and in mitochondrial energy metabolism. Increased uptake and metabolism of Glutamine through glutaminolysis can provide a proliferating cell with significant amount of NADPH requirement . Some cancer cells develop addiction to Glutamine and become dependent on Glutamine to support cell growth and activation of signaling molecules, e.g. mTOR kinase . Recent studies have explored the potential of targeting amino-oxyacetic acid (AOA) for inhibition of cell proliferation in breast cancer xenograft models . In a recent study, the expression of glutamine-related proteins was found to be highest in HER-2 subtypes compared to other breast cancer subtypes . In our study, we found a higher level of Glutamine in HER-2pos compared to HER-2neg tumors. The role of Glutamine metabolism in breast cancer prognosis and treatment is still under investigation. However, increasing evidence suggests that alterations in cancer metabolism, especially the choline phospholipid and amino acid metabolisms may provide potential targets for treatment of breast cancer. In 2010, the American Society of Clinical Oncology (ASCO) and College of American Pathologists (CAP) issued guidelines that recommended the threshold for determining ER and PgR positivity to be decreased from 10% to 1%, in order to standardize the determination of hormone receptor status by IHC and also to increase the number of patients eligible for hormone therapy. In this study, the 10% cutoff value was used according to The Norwegian Breast Cancer Group recommendation at the time of inclusion. There is an ongoing debate about whether the decrease in ER and PgR threshold has led to a group of false ERpos tumors. Studies have shown that the majority of low ERpos tumors (≥1 < 10%) were identified as basal-like or HER-2 enriched tumors with pathological features more similar to ERneg than ERpos tumors, while only a minority of low ERneg tumors was classified as luminal A subtype [52–54]. In a large breast cancer study by Engstrøm et al., only 24 out of 909 cases (2.7%) showed positive staining for ER in ≥1 < 10% of the tumor cells and were classified as ERpos according to the new guidelines . The authors found little or no change in the Kaplan–Meier and Cox results when comparing the new 1% cut-off with the previously 10% cut-off in their study. In our cohort, we found no correlation between the metabolite profiles and tumor grade and also no correlation between the metabolite profiles and lymph node status. We have previously investigated nodal metastasis using metabolite data from the primary tumor using PLS-DA, and the results showed only a weak correlation with nodal spread . Based on our results, the differences in the metabolite profiles observed are indeed resulting from the hormone and growth receptor status and not dependent on tumor grade or nodal metastasis. This study is restricted by some limitations including the small number of samples in each subgroup and the lack of normal control tissues. Most of the patients in this study were recruited less than 5 years ago, long term follow-up is thus yet not available, however this aspect will be important in future studies. In addition, it would be interesting to investigate if Ki67 overexpression is associated with adverse metabolic profiles; Ki67 was not included, however, as part of the standard histochemical staining at the time of patient recruitment in our study. Statins are a class of drugs that reduce the production of cholesterol by inhibiting the enzyme HMG-CoA reductase. In a recent study, treatment with Lovastatin was shown to decrease choline-containing phospholipids and inhibit the proliferation in breast cancer cells in vitro. The effects of statins on the metabolite profiles should also be investigated in more details. Breast cancer tumor heterogeneity is a common challenge. To minimize the effect of heterogeneity, we have chosen to include only tumors with T1/T2 stages (<5 cm in diameter) without distant metastasis. In this study, the effect of heterogeneity on the metabolic profile when sampling multiple biopsies was tested by comparing the average correlation of 35 random pairs repeated 1000 times versus 35 pairs of sample from the same patient. Our results show that the variation between patients is significantly higher than the variation within a patient (p-value < 0.001). The classification of TNBC and TPBC tumors were successfully separated based on the metabolite profiles. Choline levels were found to be higher in TNBC compared to TPBC, possibly related to tumor proliferation and oncogenic signaling. TNBC tumors had a lower level of Glutamine and a higher level of Glutamate compared to TPBC tumors, which indicates an increase in glutaminolysis metabolism and suggests the development of glutamine dependent cell growth. The classification of ER, PgR and HER-2 status were also successful. We found significantly higher levels of Glycine in HER-2pos breast cancer, which supports the potential of Glycine as a marker for tumor aggressiveness. Further studies are needed to validate the potential of metabolic markers as targets for personalized treatment of breast cancer subtypes. Variable importance in the projection. This study was funded by the Central Norway Regional Health Authority (RHA). MDC carried out the analysis and interpretation of data and drafted the manuscript. SanL carried out the HR MAS MRS and imprint cytology experiments and helped to draft the manuscript. GFG performed the Matlab programming and preprocessing of the spectral data and helped to draft the manuscript. AB analyzed the imprint cytology samples. SteL and HF recruited the patients and collected the tumor biopsies. TFB participated in the design of the study and interpretation of the results. All authors have read and helped to revise the manuscript. The final manuscript is approved by all the authors.